A Jaipur fun guide for the family and solo adventurers from shopping to fortunetellers and palaces, by Ambika Behal, and more from Smart Travel Asia and Dancing Wolf Media. Fortune-tellers, sarees, jewels, palaces and polo — it’s all here in the Pink City. 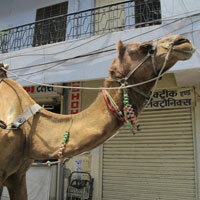 Our Jaipur fun guide for the whimsically inclined. IT’S the kind of place you discuss visiting one evening over drinks, when you suddenly find yourself scrambling home to pack a bag and rushing to catch the 6.10am Ajmer Shatabdi train from Delhi to Jaipur. Yes, it has happened to many people (not us, of course). But then who can resist a city with so much luxury — not always traditional moneyed stuff, but the beautiful kind of every-day respite, which even royals tend to appreciate. As you might have gathered, luxury is the name of the game in the Pink City — it is, after all, the very same city from which enlightened ruler, Maharajah Sawai Madho Singh II, hailed, a man who, on his first trip to Great Britain in 1902, ordered two massive sterling silver water vessels — each holding 4,000 litres of pure water from the Ganges — to be carried with him. Maharajah Sawai Madho Singh II was concerned that drinking British aqua would import great impurity to his system. Tables have turned, and these days most foreign travellers to India are wary of drinking tainted water — but the subject of water is also a notable point from which to start any tour of Jaipur’s unusual gems. 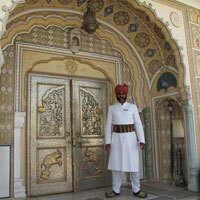 And it introduces our exploration of the city in this Jaipur fun guide. Get an early start and head to the Jal Mahal (sidewalk of Man Sagar Lake, Amer Road; Open all hours, free), the beautiful Water Palace, still owned by the city’s royal family. Here you can take in the fresh morning air and bear witness to the romance of the reflection of the early rising sun bouncing off the water. The best part: you’ll be surrounded by the meditative air of locals offering their prayers and incense to the sun and the water, and small pieces of dough to the fish in the lake. Just be prepared to be up a little early. The sun starts to show it’s cheery face around 5.45am. Hindus consider feeding animals in the morning to be quite auspicious — it’s the Law of Dharma, and the belief that animals will eventually take birth as humans, so why not show them some compassion now? Anyone can partake in this tradition in Jaipur’s Old City. Outside the gates of the City Palace (Old City, free, 6.30am-8am), one can enjoy the tranquillity of quiet streets before the sun rises any higher in the sky. Around 7am is a good time to meet and greet the vendors selling bundles of grass on the pavement — and for a few rupees one of those bundles could be yours. Feed the cows (mind your fingers though), and then head to the bajra (bird seed) vendors, who can explain the benefits of any of the varieties of seed available with which to feed the pigeons and other feathered visitors. If you’re up early in any case, enjoy a spot of people watching and some Kodak moments at the Phool Mandi (Flower Market, Janta Market, Chandi Ki Taksal, free, 8am-12pm). You’ll see traditionally turbaned villagers bearing bundles of colourful saris and spot dazzling flashes of freshly picked marigolds and roses that relay their beautiful scent across the city’s havelis. Buy stuff by weight. 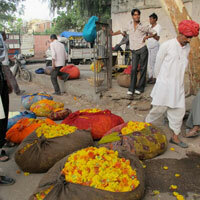 Tackle the neighbouring Sabzi Mandi (vegetable market) with all its hagglers, if you dare. With all the early morning sights in the bag it is time to be waited on hand and foot. For those looking to live like a real maharajah or maharani for a few days, there is no better place than Raj Palace (tel: [91-141] 263-4077, Zorawar Singh Gate, Amer Road, www.rajpalace.com), which exudes luxury from the moment the tall Rajput guard at the entrance puts his hands together and greets you with the traditional Rajasthan khamma ghani. Owned, and even still partly inhabited by, real-life royals, the hotel offers a wonderful taste of the opulence and hospitality the region is known for. If you’re lucky enough to get the four-floor Maharajah’s Pavilion suite, look forward to rooms (and bathrooms) gilded in gold and silver. Staying here also entails brushing your teeth with water flowing from gold-plated taps. If a stay isn’t in the cards, do go for a dinner at the hotel’s Kebab Shop, a magnificent outdoor dining venue, and be pampered by royal chefs cooking up a storm at the barbeque grills. This is India, so vegetarians are also well catered for. If that real one-time moment romance is what you’re looking for, there may be no place more fascinating to pop the big question, than on the outskirts of the Pink City. At Dera Amer Valley Camp (tel: [91-141] 222-8468; Village Khurad, Kukas, Tehsil-Amer, deraamer.com) head into the sunset on the back of an elephant and propose to your heart's content while the birds twitter and you wend your way at a steady pace through the jungle and villages lost in time. The ideal time to go is for high tea, when the camp puts up a superb colonial spread for visitors. Or else head out on one of the torch-lit night rides, which can be particularly special on a full moon night. In fact, if you want to keep up that feeling of being in a Bollywood film for a little longer, there’s no better place to go than Raj Mandir (tel: [91-141] 237-4694, B-16 Panch Batti Bhagwan Das Road, C Scheme). Step inside and you’ll find Disneyworld pastels meeting regal detail — yes, it is the cinema hall greatly beloved of Jaipur and the Bollywood film industry. Expect the occasional film premiere here. It doesn’t really matter if you understand the language or not. Actions speak a thousand words. Lunch is a tough decision in this city. There’s a lot of choice, but one can get stuck in all the tourist traps serving mediocre fare. Instead, try the best South Indian restaurant in town — it’s so quintessentially un-Rajasthani, but that’s part of the appeal here. Expect quick and simple fare at Dasaprakash (tel: [91-141] 237-1313; 5 Kamal Mansion, MI Road; www.dasaprakash.in). It’s perfect for a light lunch that won’t put you to sleep under the year-round afternoon sun. It is the Jaipur branch of a small chain spread across North India, but Dasaprakash is certainly no McDonald’s, and you’ll find a warm welcome and good nosh. Definitely opt for the delightful masala dosa with idli sambar and follow it up with a taste test running through the restaurant’s particularly good specialty ice cream menu. After lunch is always a good time to do a little shopping and this is a city in which visitors can really splash out. For the best shop-like-a-princess experience, head to the pretty boutique set up by Princess Bhargavi Kumari Mewar of neighbouring city, Udaipur. Aashka (tel: [91-141] 256-9853, Hotel Narain Niwas Palace, Kanota Bagh, Narain Singh Circle, www.aashkaindia.com) is filled with a mix of unusually striking home ware and a large range of classy clothes and accessories for the girls. Every Cinderella of course wants her (or his) shoe to fit, so it’s off to buy a pair of typical Jaipuri shoes, known as mojaris. This impish (no pun intended) footwear is known for its lightly pointy toes, exquisite embroidery, and supreme comfort. At Raj Chappal Store (tel:  978-412-0235, shop number 162-A, Bapu Bazaar) prices for a simple pair of mojaris start at around Rs100 rupees (US$2), while a very elegant pair can set you back as little (or much) as Rs150 rupees. These shoes are intended to be worn by both ladies and gents and if you want something open-toed, just ask. Don’t be shy. This is after all a Jaipur fun guide. Jaipur is well known for its hand block printing techniques, and bandhani (tie-dye) cloth patterns and designs. It’s not hard to find beautiful cloth and clothing in Jaipur, but here, for the ladies, it’s really more about adding that extra bit of beauty to any outfit. The lac bangles worn by women throughout Rajasthan, are considered to be lucky accessories. Made naturally, they are eco-friendly, bio-degradable and luxurious, yet at accessible prices. 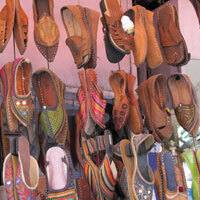 Head to Maniharon ka Rasta (Old City, Daily 11am-9pm), the traditional bangle lane. At any stall you can choose your own colours, design, crystals, beads, mirrors (anything short of a unicorn essentially), and get a set of beautiful, personalized and custom-fitted bangles made in front of you, almost instantly. It’s like grabbing a pint of beer in the United Kingdom: a necessity, rain or shine. Beat the desert summer heat with one of Jaipur’s famed lassis. This a sweetened, whipped yoghurt drink served up in a traditionally hygienic mutka khullar cup (made of red clay). The most famous lassiwalla is at any one of three shops on MI Road, all of who claim fame to be the oldest (or 'oldted' as one shop front sign boasts) and best in town (who to believe?). But our pick is cleaner, has no tourist lines, and we adore the lassi. Head to Sweet House (tel: [91-141] 232-5718, at 39 Kishanpole Bazaar), where standing on the street downing a lassi with the locals can earn you major kudos. Stay sweet with another of Jaipur’s luxuries: mithai, or sweets. Although most Jaipurias will point you toward the kachoris or paan as snack foods, this one’s a little more indulgent. Find your way down an alley or two (or just ask the nearest local), and join the quickly moving line at MK Caterers (tel: [91-141] 232-3390, at 453 Natani Street, Chaura Rasta), and then see how many of their delicious ladoos you can stuff into your mouth at once. It’s a real art form: just watch the person next to you. For those who love mathematics, geometry, or just plain living art, there’s a wonderful Step-Well (on the right side immediately before Anokhi Museum of Hand-Printing Haveli, Khedi Gate, Amer) hidden discreetly in the vicinity of Amer, a little after you pass the fort complex on your left heading out of Jaipur. The well remains nameless, and local ladies will only tell you that it was built in one night by ghosts, like many of the step-wells (known as baori) in the area. Toss a coin down the steps, and it will almost certainly never be seen again, at least not in this century. Spooky. Whilst you’re there, take in two minutes of absolute peace and quiet at the ancient temple across the street, and then head just a few minutes further on through the Khedi Gate to the Anokhi Museum of Hand-Printing (tel: [91-141] 253-0226, Chanwar Palkiwalon ki Haveli, Anokhi Haveli, Kheri Gate, Amer, www.anokhi.com/museum/visit.html), which has a fabulous little Indo-western café for a bite to eat. Most peaceful moment in Jaipur (and you’re going to want some of that after the noisy traffic of the Old City experience), is definitely to be found in plenty on the very edge of the city at Dhammathali Vipassana Meditation Centre (tel: [91-141] 268-0220, via Sisodiya Rani Baug, Ghat ke Balaji, Galtaji Rd, www.thali.dhamma.org). You can visit the beautiful pagoda-like buildings at the centre itself just to see — one day courses are offered every Sunday from 9am to 4.30pm, both at the centre and in Jaipur itself (tel:  982-816-1955, Dhamma House, B-25, Parshvanath Marg, Parshvanath Colony). For those more serious about finding themselves, full courses are not for the faint-hearted: 10 and 30-day meditation retreats are offered for beginners, in which no mobile phones, laptops, or books are allowed. It’s a city known for its love of astrology — after all, the planned city of Jaipur, founded in 1727 by Maharajah Jai Singh II, was built in the shape of a nine-part mandala mimicking the nine planets of the ancient astrological zodiac. Thus it is of no surprise that inhabitants of the city even today continue to hold strong beliefs in the astrological properties of gems, and fortune telling. 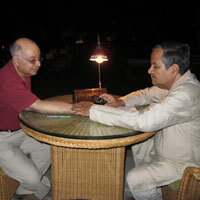 For one of the most unique fortune telling experiences, go straight to the Rambagh Palace, where palm reader KK Dandiya (tel:  982-816-0598, Rambagh Palace Hotel, Bhawani Singh Road, 2-4pm and 7-10.30pm, ask at reception) has been practicing his art since 1980. He speaks perfect English, and has read the palms of celebrities including tennis ace Boris Becker, Bollywood hotshot Shahrukh Khan, steel-industrialist Lakshmi Mittal, and the late Maharani Gayatri Devi, among others. You’ll learn about your life plan and how to manage your characteristics under various circumstances, as well as what gem(s) you should be wearing to keep your life under control, lucky days, colours, and numbers. Believe at will. Jaipur as a city is very much divided into two camps: those who love polo, and those who love polo. Those who love polo can go rub shoulders with the rich and famous either through playing the sport or just lounging at the Jaipur Polo and Riding Club (tel: [91-141] 235-8056, B-21, Tulsi Marg Hanuman Nagar, Khatipura, www.jaipurpolo.com). The rest of you can pretend to enjoy polo over a drink at the famed Polo Bar at the Rambagh Palace Hotel (tel: [91-141] 221-1919, Rambagh Palace Hotel, Bhawani Singh Road). Here again, you’re likely to rub shoulders with a well-heeled Jaipur crowd, so remember that a chukker is seven-and-a-half minutes and a neck shot is when a polo player hits the ball under the horse’s neck. The entire city is painted in off terracotta pink. The main reason for this hue is that the entire city was given a fresh coat in honour of Prince Albert’s 1853 visit and has remained pink ever since. 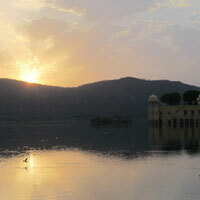 And what better way to view that colour and Jaipur’s mountainous backdrop than under the last rays of the setting sun? Take a drive up to Nahargarh Fort (tel: [91-141] 514-8044, Nahargarh Fort, also known as Tiger Fort) and look for the Durg Café Padao restaurant. Pay the Rs50 entrance fee (includes entry and a cup of tea at the open-air restaurant), which boasts a spectacular vantage point from which to view the entire city. For those wanting to save their pennies, head to the turret of the fort on the top corner and you’ll get a view just as good, without the tea and comfort food. If you want to really spoil yourself with an exhilarating view over the city and an experience to match, then Sky Waltz (tel: [91-971] 729-5801,  981-041-4012, various sites across Jaipur, www.skywaltz.com) is one of those so-secret plans that many of the locals have never heard of it. Jump into a fully licensed hot-air balloon and take a deep breath as you float across the city and its surrounding forts, desert, jungle area and villages. Do be warned though, this service is halted during the summer months (April-August) due to heat, so catch your air chariot while you can. After a hectic day of climbing, sightseeing, shopping and fortune-telling, it’s not too late to take in some more of that Rajasthani romance. At Samode Haveli (tel: [91-141] 263-2407, Gangapole, www.samode.com) it must be that elephant ramp at the front of this former royal refuge, which keeps it all so real. From here you enter a world of plush calm where there are just a few tables, some candles, and the open sky and stars above. Although the main purpose of the haveli these days is as a small hotel, dinner in the open courtyard is a rich enough experience in the luxuriously simple surroundings. And that brings us to the end of our no-holds-barred Jaipur fun guide. After dinner, wave a big hello to a passing camel. It is Jaipur, after all.